Drawing from the principles of design thinking and systems thinking, RIKON has designed a 5-stage user-led innovation process that involves imagination, intuition, and systematic reasoning to solve wicked problems by exploring, experimenting and visualising the possibilities of what could be (i.e. future state) to arrive at a customer centric design solution that is fit for purpose, risk-free and produces extraordinary results that leapfrog the expected. Principle 1: “We Diverge to Converge”. Our innovation process encompasses divergent and convergent modes thinking. The divergent mode is about exploration (Understanding) whereas convergence is solution oriented (Outcomes). Principle 2: “Innovation Starts and Ends with People”. The core foundation of our innovation process is Empathy. Everyone has a story and through empathy we can understand the way users view the world and what is meaningful for them in order to produce customer centric solutions. Principle 3: “Harvest the Minds of the Many”. Successful innovation comes from the minds of the many and it is through collaboration where ideas and solutions are found. Leverage the collective intelligence of your network of interdisciplinary disciplines and backgrounds. Principle 4: “Fail Early and Often”. There will always be ambiguity and mistakes made during the innovation process. Embrace it and extract the learnings and experiment early to arrive at the correct solution. Principle 5: Visualise the Future State. Ideas must be examined and producing low-fidelity prototypes facilitates discussions and insights with others. The innovation process consists of five stages. Explore: We conduct the mapping of existing business challenges, SWOT external analysis, industry trends, competitors best practice analysis. The focus here is to diverge our thinking to understand all perspectives and all the possible problems. Reframe: We interpret the insights from the Explore stage and translate this into meaning for the client and identify the key challenges and problems. Our goal is to converge on a Point of View and develop the right problem statement. Ideate: Brainstorm is divergent activity and our goal in this stage is to create numerous solutions to the identified problem or Point of View in the reframe stage. 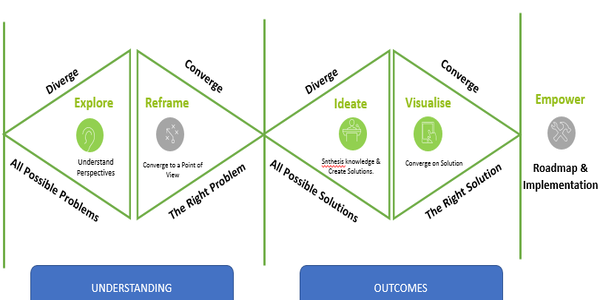 Visualise: In this stage, we converge on the right solution to solve the problem. We attempt to visualise the intangible and make it tangible through prototyping and simulation. Empower: Critical to the success of any innovation is the empowerment of our clients. Our innovation process is highly collaborative. We work with our clients to arrive at the right solution for them. On closing out the project, we provide a roadmap of action points to assist you in implementing your new innovative strategy. Bringing science to the art of strategy, our BizTech strategists use this process to create, incubate and deliver a future for your organisation that will allow to jump your competition. In a world of radically changing products and disruptive technology, can your company afford not to start thinking differently? Let our Difference be your Competitive Advantage.